This is our current trading plan for the GBP/NZD. The D1 trend is pointing up. Set a price alert at the 2.3380 level. When the alert hits check The Forex Heatmap® for a buy signal. There are several GBP news drivers upcoming in the main trading session. Past the price alert point there is plenty of upside potential, possibly to the 2.4400 area, which is approximately 1000 pips. We prepare trading plans daily for 28 currency pairs at Forexearlywarning. Today in forex trading The Forex Heatmap® alerted forex traders to the GBP (British Pound) strength in the market. This caused good price movement on all of the pairs in the GBP group of pairs. The NZD (New Zealand Dollar) and AUD (Australian Dollar) also had some minor weakness. The GBP/AUD and GBP/NZD moved strongly higher. Both pairs are trending higher on the larger time frames and trends. The GBP/AUD has not broken through all of the near term resistance, but the GBP/NZD has fully broken out and should continue much higher. The visual alert system you see below is The Forex Heatmap®, which gives trade alerts for 28 currency pairs, and 8 different groups of currency pairs. Today in currency trading the GBP (British Pound) strength caused significant price movement on these pairs. There was also some NZD (New Zealand Dollar) and JPY (Japanese Yen) weakness in the market. The GBP/NZD and the GBP/JPY moved much higher. 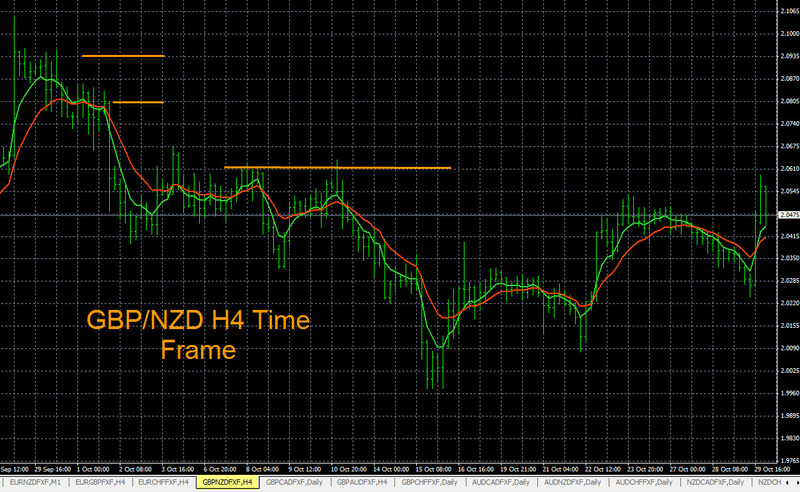 The GBP/NZD has broken out of a resistance range and could be headed much higher on the W1 time frame trend. The GBP/JPY also moved much higher, but this pair is hitting one resistance level at the 187.50 area, so we would be scaling out lots on this pair. The GBP strength indicator you see below is The Forex Heatmap®, which measures strength and weakness in 28 currency pairs, and eight currencies, to guide forex traders. The GBP/NZD trend analysis is shown below. This pair is building a trend to the upside on the D1 time frame. Currently the price alarm point is around 1.9980. When the price alarm hits we would look for a buy signal on The Forex Heatmap® to verify the trade entry. There is significant upside potential up to the 2.0700 area indicated by the red lines, this is over 700 pips of potential. Historically, this pair tends to behave like an oscillating pair, cycling up and down on the D1 time frame between support and resistance. The trend indicators you see are exponential moving averages, then analyzed across multiple time frames and individual currencies. Today in forex trading the GBP/NZD had a sell signal on The Forex Heatmap®. The British Pound (GBP) was mostly weak and the New Zealand Dollar (NZD) was strong, as shown on the heatmap below. This drove price movement on the NZD pairs. The GBP/NZD dropped very hard, it is currently at one support level and we would scale out some lots here at the current prices and support. The NZD/USD also rose on the NZD strength but this is a short term trade only inside of trading ranges. The signals you see below are from The Forex Heatmap®, which provides live buy and sell signals for 28 pairs in both forex trading sessions. The GBP/NZD trend analysis shows that this pair has a resistance level at 2.0600, see yellow line. You can set a price alert at this point. When the price alert hits look for a buy look for a buy signal on this pair on the Forex Heatmap®. The next resistance levels are are 2.0800 and 2.0900 for possible profit taking. 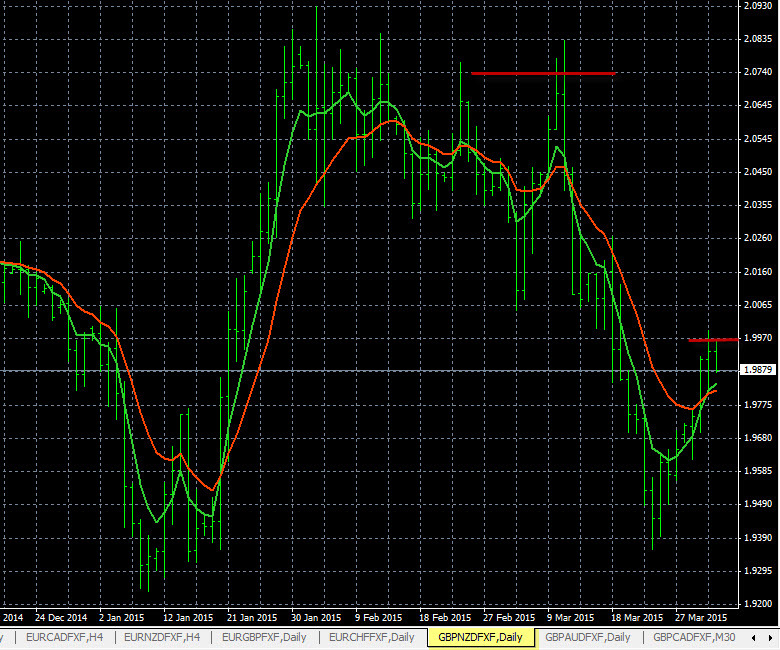 The larger trends are also pointing higher on the GBP/NZD so this pair could eventually move well past 2.0900. The trends and support and resistance on this pair were analyzed with multiple time frames.